Engineers and conductors, now riding together in the cab of the lead locomotive, and no longer at opposite ends of the train that they’re running, see many different things, according to the route that they are traveling. Since they typically work on a particular section of the rail network, much of this becomes very familiar and routine. On the other hand, some scenes, even though viewed frequently for years, may produce more reactions than others. 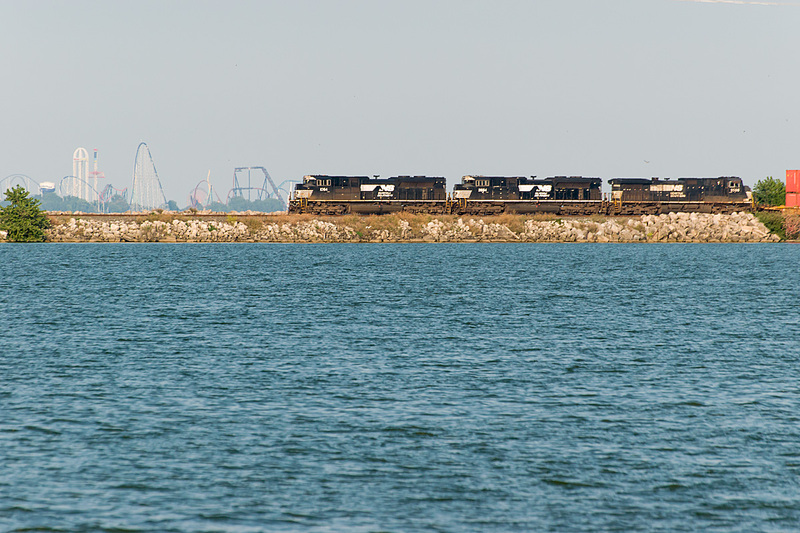 Take, for example, this view of the roller coasters at Ohio’s Cedar Point amusement park, just off to the east of this Norfolk Southern westbound crossing Lake Erie’s Sandusky Bay at Bay View, Ohio. This serves as an unsubtle reminder to the passing NS crews that they are at work, while those partaking of the ‘coasters are out relaxing and enjoying themselves. It’s probably not a great idea for an operating crew viewing this to become too wistful, however, since they bear the responsibility of accomplishing their task safely and efficiently, and it’s best to attend closely to the task at hand, as it may be necessary at any moment to alter the forward progress of their ride that weighs thousands of tons, likely is greater than a mile in length, and often is transporting cargo that we civilians are glad is not on the public highways. At one time, operating a locomotive, in particular one powered by steam, exerted a powerful magnetism on many, particularly boys of all ages, notwithstanding the not-infrequent cornfield meets, boiler explosions, derailments, etc. In addition, in the not all that distant past, the work day could last as long as 16 hours, and many crews spent close to that in their travels across 100-mile operating divisions. Yet for this a man would leave the security of a shoe store, the smell of fresh-plowed earth, the regularity of factory hours. Or he’d suffer the conscious frustration of having passed up the great adventure for cash or comfort or acclaim. For the reward of the smoke and the sweat is to hold in the palm of your gloved hand the throttle of a 189-ton Baldwin, to know that each notch of the curved ratchet overhead feeds more superheated steam into a pair of 28-inch diameter cylinders with a 32-inch stroke, to realize that this rocking, pounding boiler stuffed with tubes and charged with 200-pound-per-square-inch energy is yours to urge and restrain. Today, of course, Baldwins of any ilk, much less steam-powered, are almost nowhere to be seen, much less run. Today’s micro-processor-equipped, anti-wheel slip, no-short-time rating AC power bears little resemblance, in some ways, to what Morgan evokes. 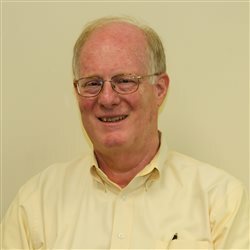 While steam locomotives had the reputation of being fairly individual creatures, today’s diesels don’t generally merit the same distinction, and items like “Leader” software, banner tests and soon, PTC (positive train control) certainly have taken a lot of the romance out of the job. Still, it’s an opportunity to control, with your hands and mind, a very large piece of machinery, doing work that is vital to the economy of the nation, and for that matter, the world. I suspect that a fair number of the people at Cedar Park would be happy to trade places, at least once. Lower speed and the fact that the vehicle in motion will remain upright at all times wouldn’t matter in the least; it would be a thrilling ride even without actually being at the controls. And unlike 1953, I have a strong suspicion that this is no longer confined to a single gender.